Which software can help me to get Blu-ray to Galaxy Note 8? How can I play Blu-ray on Galaxy Note 8 freely? In this article we will share the best tool with you which can help you to rip Blu-ray disc movies to Galaxy Note 8 supported video formats within few clicks, it can help you to get rid of Blu-ray copy protection and help you to convert Blu-ray to unprotected videos for watching on Samsung Galaxy Note 8. How to watch Blu-ray on Galaxy Note 8? Samsung Galaxy Note 8 is one of the most popular Android smartphone that released in 2017, we all know how the Note 7 lived a shorter product life than it deserved. There are many Note-lovers have waited Galaxy Note 8 for a long time, but now we can choose to buy Galaxy Note 8 as new smartphone, the Galaxy Note 8 has so powerful equipments. It has 6.3″ Super AMOLED ‘Infinity Display’, 2,960x1440px resolution, 18.5:9 (2.06:1) aspect ratio, 522ppi; 6GB of RAM; 64GB of storage; microSD slot for cards up to 256GB, UFS cards support. What’s more, Samsung Galaxy Note 8 is the best screen DisplayMate has ever tested, so it is ideal device for we to take, and it’s great to play videos and movies with Note 8. As the questions showed above, there are many users have the need to copy Blu-ray to Galaxy Note 8 for watching on the go, but most of them don’t know the detail way to get Blu-ray to Galaxy Note 8, as we know, the Blu-ray discs we purchased are all copy protected, we can’t copy movies from Blu-ray discs and then transfer to Galaxy Note 8 directly, the copy protection technology will limit this method. In this case, how can we watch Blu-ray on Galaxy Note 8? We need to use special software to remove copy protection from Blu-ray discs and then convert Blu-ray to Galaxy Note 8 compatible format for watching. 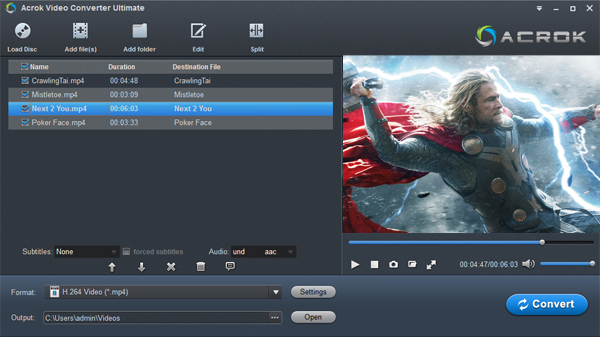 Acrok Video Converter Ultimate is the best Blu-ray ripping software that enables you to rip the Blu-ray disc to your portable device or computer for backup purposes or to have an alternative way of watching them. It outputs wide range of video and audio formats, including H.264 MP4, H.265 MP4, H.265 MKV, uncompressed MKV, multi-track MP4/MOV/AVI and more. The best part is that, Acrok Video Converter Ultimate has support for nearly all the latest Blu-ray and DVD discs, and it can rip Blu-ray to Galaxy Note 8 with up to 30x times ripping speed utilizing the most advanced hardware acceleration NVIDIA CUDA & NVIDIA NVENC by H.264/H.265 codec, which can give users video transcoding speed than before, in this case you can rip Blu-ray to Galaxy Note 8 quickly. Using this Blu-ray to Galaxy Note 8 converter, you can also choose to backup Blu-ray via “Full Disc” and “Directly Copy”. It even can directly copy 3D Blu-ray retaining the 3D effect or convert 3D Blu-ray to 3D MP4, 3D MOV, etc. You can also edit encoder settings manually, to achieve the desired image quality and file size. You are available to change the output file’s format, video resolution, frame rate, bitrate, as well as audio sample rate and channel mode. How to rip Blu-ray to Galaxy Note 8 supported format? Install and launch the best Blu-ray to Galaxy Note 8 Converter. Insert your Blu-ray disc into your BD drive, and click “Load disc” icon to load your Blu-ray movies discs. 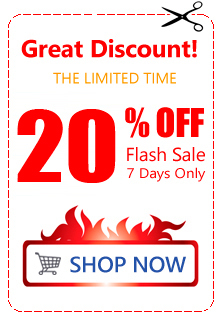 You can also import movies files from Blu-ray folder, Blu-ray ISO image, DVD disc, DVD ISO, DVD folder, etc. Click “Format” to open the drop-down window and choose Galaxy Note 8 supported format. 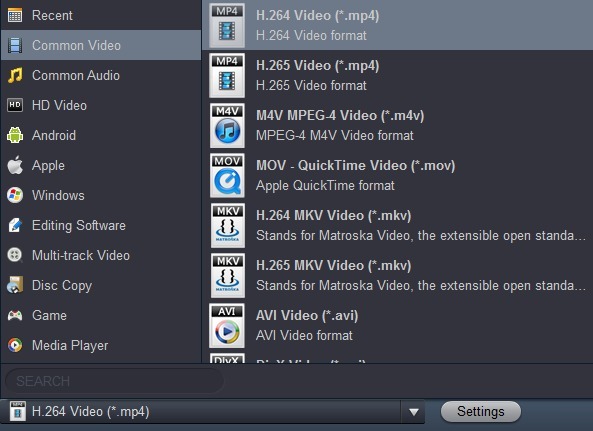 You can choose Common Video -> H.264 MP4 Video, you can also choose MKV, AVI, MOV, etc. according to your need. Meanwhile, you are allowed to adjust profile parameters like display resolution, bitrate, frame rate, audio sample rate to achieve the best video and audio playback on your device. Click the “Convert” button and Blu-ray to Galaxy Note 8 video Conversion begins. When the conversion is done, open output folder, find ripped movie in output folder and transfer movies to Galaxy Note 8, now you can play Blu-ray on your Galaxy Note 8 freely.